Centre de Santé Marcel A. Desautels | prairie architects inc. 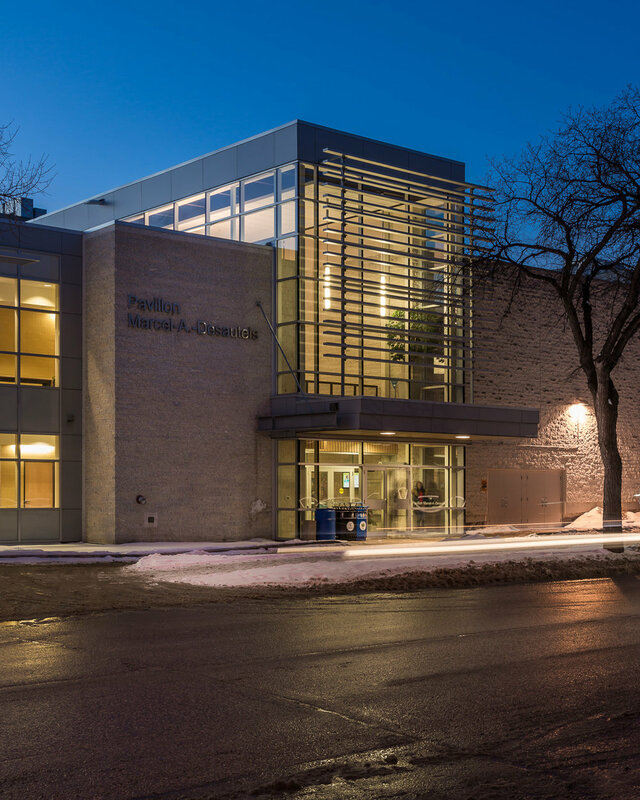 The 25,000 s.f., $11.5 million Health Pavilion addition at the Saint-Boniface University enhances the University’s health programs by offering a modern learning environment without precedent and acts as a transition from existing facility to the new. 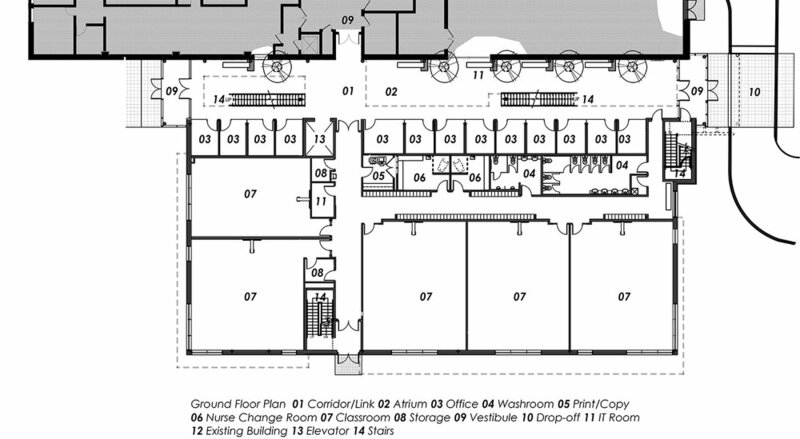 The new structure incorporates 5 classrooms, 3 nursing laboratories, a simulation centre, 2 videoconference rooms and 27 offices. 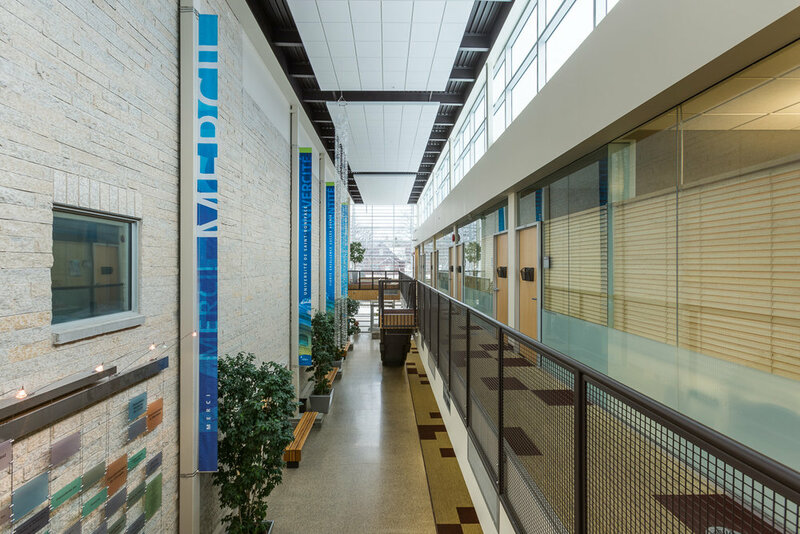 The international demographic of people attending the Saint-Boniface University has changed greatly today and as such, the University’s needs and institutional offerings have changed. 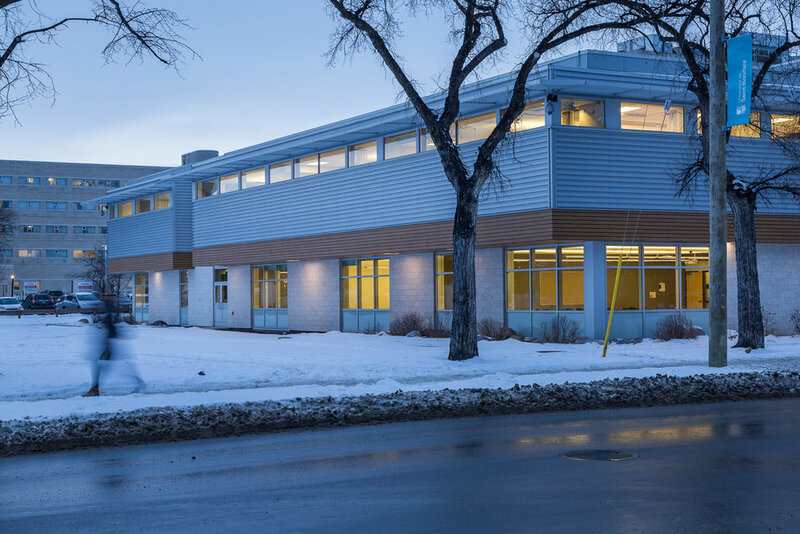 Moving from a small local francophone institution since the time of educating Louis Riel, to the global market, means utilizing a modern architecture while respecting green notions and balancing a regionalist practice of site and place. Thus it seemed befitting to design a new space unlike the remaining University, which has been traditionally internalized and introverted, with a warm and sunlit Atrium forming a visibly accessible and inviting space seen from the outside in. The existing institution’s dominant Tyndall cladding, significantly added to over the years by Etienne Gaboury, forms a distinct element of the entire University, therefore the continued use of the local stone provides the new facility with a local vernacular with embodied sense of permanence, stability and place. La ‘coupole’ (dome), which has served as a community institutional landmark since the beginning of the institution in 1855, is reintroduced aesthetically in the new facility’s polished metal cladding parapets surrounding the building and again in the clear anodized frames of the curtain-wall as a nod to the past institution’s early beginnings. 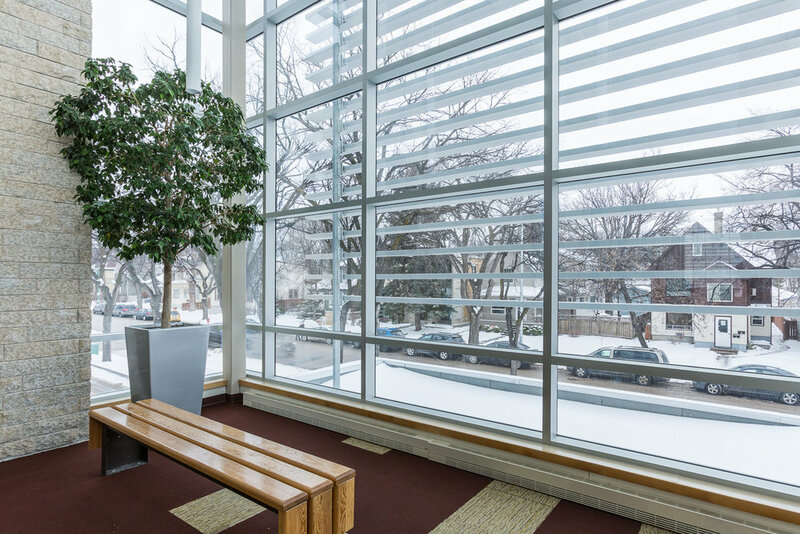 The glass curtainwall acts as the counterpoint from existing Gaboury building addition to new by utilizing the clear transparency of the glass which lightly integrates new into old, contrasting the heavy sober Tyndall wall and the light atrium. The new offices lining the main floor and second floor of the Atrium, further confronts the notion of traditional office by using full height transparent glass to flood the offices with both indirect sunlight reflected from the adjacent Tyndall wall while promoting increase student access. The new pavilion is a sustainable facility, Certified LEED Gold. Digital screens in public areas feature information highlighting the building’s energy efficient design. It uses a passive heating and cooling system utilizing a horizontal ground loop heat exchanger for distributed heat pump system and a high efficiency building envelope which helped achieved an energy cost savings of 56.8% compared to a baseline building designed with the Model National Energy Code for Building’s standards. The facility aims at providing the student clientele with an unprecedented modern facility offering an inspired, technologically advanced and quality filled educational environment, which officially opened the Summer of 2011.